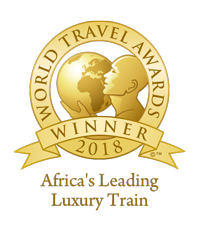 The Blue Train Wins Africa’s Leading Luxury Train 2018 at the World Travel AwardsThe iconic Blue Jewel of South Africa, The Blue Train, walked away with Africa’s Leading Luxury Train accolade at the World Travel Awards Africa & Indian Ocean Gala Ceremony 2018 held at the Durban International Convention Centre in Durban, South Africa, on Saturday October 6th, 2018. This is the 10th year The Blue Train has won this award, since 2009. “This is a fantastic nod for The Blue Train, a recognition that affirms our place in Africa’s luxury travel landscape. That it comes from the leaders who make this industry, with an appreciation of what goes into providing the five-star service on the train, is a much appreciated validation,” said Vincent Monyake, Executive Manager at The Blue Train.